Why is it a good idea to look for new physics at the Large Hadron Collider (LHC) in collision events that produce three or more charged leptons or anti-leptons? The basic principle is simple. Leptons are rarely produced at a proton-proton collider by effects of the known particles and forces (the “Standard Model” of particle physics). Two leptons (or anti-leptons) are still more rare; to make three at once is very rare indeed. And a variety of speculative ideas for new physics that might be observable at the LHC can significantly increase the rate for producing three leptons and/or anti-leptons in collisions where the total detected energy — from the leptons/anti-leptons and/or other particles (neutrinos, quarks, anti-quarks, gluons, or new invisible particles) — is high. So without being too specific about what new physics we’re looking for, we can go check to see whether the rate for multi-lepton production is consistent with the small rate predicted by the Standard Model’s equations. Why are multi-lepton events so rare? What kind of new physics can produce multi-lepton events? At a proton-proton collider, quarks, anti-quarks and gluons are made with ease. There are quarks, anti-quarks and gluons inside the proton ready to have collisions; and when such particles collide, the most likely thing to happen is that they will scatter off each other like two billiard balls, causing them to fly out sideways to the beam. Such particles then are transformed into sprays of hadrons, called “jets”. And the next most likely thing to happen when quarks or anti-quarks or gluons collide with one another is that they produce new quarks, anti-quarks or gluons in the collision. These, too, form jets. So jets are commonplace at a proton-proton collider. 1 lepton, in about 20% of the decays of a bottom or charm quark, or even 2 for bottom quarks. But these types of leptons are usually inside the jet associated to the bottom or charm quark; they are not “isolated”. 2 isolated leptons (specifically a lepton and anti-lepton of the same “flavor” — electron, muon or tau), from 9% of the decays of a Z particle. 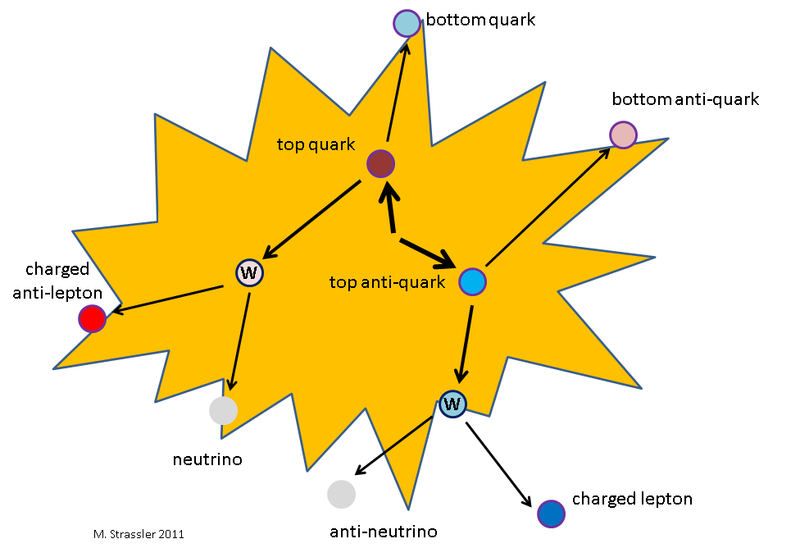 A top quark decays to a W+ particle and a bottom quark; the W can produce an isolated anti-lepton 30% of the time, while the bottom quark can produce 1 or 2 (generally non-isolated) leptons/anti-leptons. Bottom and charm quarks are common, so leptons are not that uncommon. But isolated leptons are only produced by W and Z particles (rare because they do not feel the strong nuclear force and must be produced through the weak nuclear force) and top quarks (rare because they are quite heavy and relatively hard to produce). An isolated lepton from a W particle is made once every 10,000,000 collisions or so. An isolated lepton and anti-lepton of the same flavor are made from a Z particle once in every 100,000,000 collisions. An isolated lepton and anti-lepton of the same flavor that do not come from a Z particle (and therefore have energies that do not add up to the Z mass-energy [almost true; see here]) requires a Z or photon virtual particle (roughly once in every 1,000,000,000 collisions). 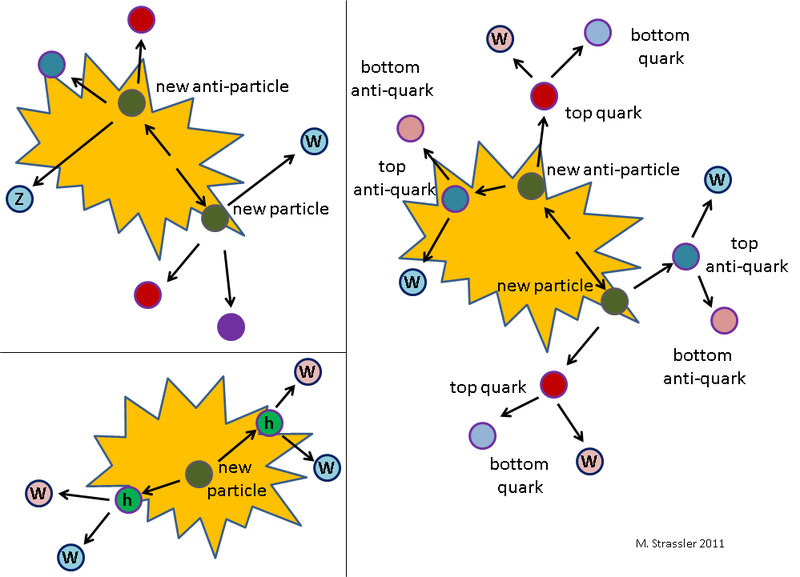 An isolated lepton and anti-lepton of not necessarily the same flavor, from a top quark and a top anti-quark (which are most often produced together, see Figure 2) are made once every 10,000,000,000 collisions; these collisions, unlike those with Z or photon virtual particles, tend to have jets from a bottom quark and a bottom anti-quark, and signs of invisible particles (“missing `energy’ ”) from a neutrino and anti-neutrino. 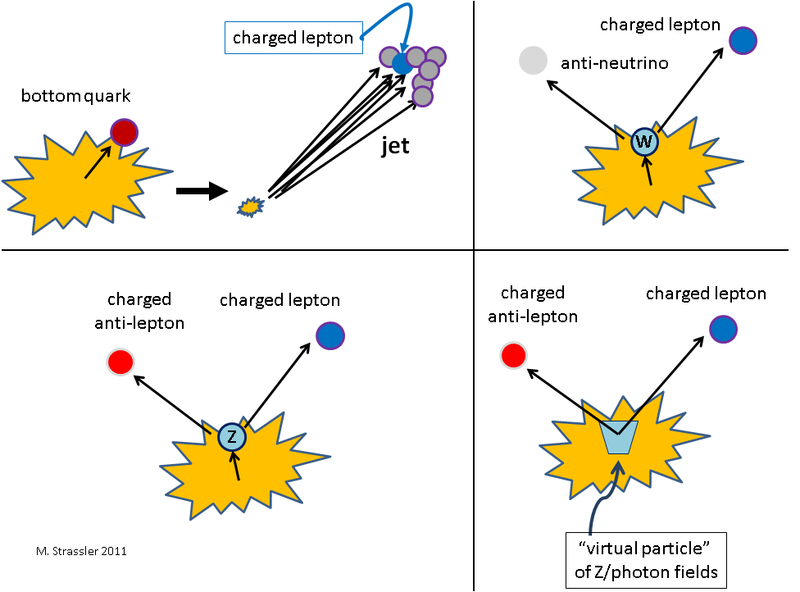 Three isolated leptons and/or anti-leptons, where no lepton/anti-lepton pair could have come from a Z particle (therefore requiring they come either from a virtual photon or Z [in which case they have the same flavor] or from a top quark/anti-quark pair [in which case they may not]) happens once every few 1,000,000,000,000 collisions. All of these numbers are very rough, for many reasons; they are just intended to give you the basic sense of things. Fig. 2: Production of a top quark/anti-quark pair leads to a lepton/anti-lepton pair about 10% of the time. This can become a multi-lepton event in the rare case that the bottom quark or anti-quark produces an accidentally isolated lepton or anti-lepton. For scale, as of October 2011, each LHC experiment has seen about 500,000,000,000,000 collisions, and analyzed less than half of that data. And since the probability of detecting all three isolated leptons in a single collision that produces them is less than 25 percent, the number of events recorded of this last type so far is less than 100. Moreover, many of the events of this type that are observed by an LHC detector are not what they seem. There are sources of extra leptons that have to be accounted for, stemming from the fact that detectors are not perfect, and from physical effects that I haven’t yet mentioned. These involve rare accidents, but since the sources of isolated multi-lepton events are rare too, they can’t be ignored. I emphasized that there are many bottom quarks and charm quarks that produce leptons in their decays. These tend to be non-isolated, and they also tend to carry rather low energy. But occasionally they are isolated, just by chance. As you try to search for multi-lepton events with lower and lower energy, the more of these accidentally-isolated leptons you will find, and the more often one of these will be combined with an event with two isolated leptons from other sources to make a three-lepton event. For instance, this can easily happen in a collision where a top quark and top antiquark are produced, as in Figure 2; the W+ and W- particles produced in the top and anti-top decays can produce a lepton and anti-lepton, and either of the bottom quark or bottom antiquark can accidentally produce an isolated lepton. Sometimes a jet from a quark, antiquark or gluon will look like an electron. This can only happen if the jet is very unusual and a couple of accidents happen, but there are so many jets at the LHC, and electrons are so rare, that this possibility cannot be ignored. Fake taus (and anti-taus) are quite common, because taus (unlike electrons and muons) will decay before passing through a detector, and a jet will occasionally look like the decay of a tau lepton. This is described in more detail here. Any search involving taus will have larger backgrounds than those that don’t, and one cannot study taus at as low an energy as one can manage for electrons or muons. Another important background stems from an effect of virtual photons that produce a low-energy lepton and a low-energy anti-lepton, one of which has so low energy that it is undetected or, if detected, not firmly identifiable as a lepton. This particular background has been emphasized especially by my theoretical and experimental colleagues at Rutgers in a recent joint paper, and it’s so important, interesting, difficult to calculate and underappreciated that it deserves its own article. There are other potential sources of undesirable leptons or fake leptons too. The rates for all of these rare processes have to be accounted for; they cannot be calculated, so they must be measured in the data! It is absolutely essential this be done right, since for many questions these rare fakes actually form the largest source of background, rather than the more calculable backgrounds I described in the previous section. This is the great challenge in looking for rare physical processes; one has to worry about very rare accidents which can make an unrelated object resemble one’s quarry. A great deal of cleverness on the part of the experimenters is required; carrying this out properly is quite a tour de force! Many types of new physics can give multi-lepton events. One way nature could do this (Figure 3) is if there is a new particle that can produce a W or Z particle in its decays, or even just produce an appropriate disturbance in the W or Z field (called a “virtual particle”, but not really a particle at all.) If the new particles can be produced in pairs (i.e., the particle along with its antiparticle, typically), then it is common for the event in question to include both a W and a Z particle, or virtual particles from both W and Z fields. This can lead to three leptons. In some theories, the presence of lepton-like partner particles (such as lepton superpartners in supersymmetry, also called “sleptons”) can participate, replacing the W and Z. Since they decay to leptons or neutrinos all of the time, they can often enhance the number of multi-lepton events compared to events with a W and Z, only a few percent of which produce three leptons. There are many other possibilities. However, the most famous motivation for the multi-lepton search comes from supersymmetry. You can read about why many variants of supersymmetry can produce multi-lepton events here. However, as I’ve just emphasized, supersymmetry is by no means the only or even the most likely new-physics source of multi-lepton events. If an excess of events really does emerge at the LHC, we’ll need a lot more information than just the presence of an excess to diagnose what is causing the events. Pingback: Standard Model Tutorials for the Masses (…er, sorry about the pun…) « Whiskey…Tango…Foxtrot? approach of writing? I’ve a presentation next week, and I am at the search for such information. What a informative article on the topic of A Good Place to Look for New Physics. I think you have a lot of information regarding it. Continue to sharing such kind of article. our company offer LaGuardia Airport shuttle. Thanks a lot for this post.